The Polytechnic is a government-owned and funded institute of technology offering courses in Tauranga and the Western Bay of Plenty region of the North Island. IT manager Rabindra Das said that his team was faced with frequent network outages and rising complaints from frustrated students. He decided to implement Extreme Networks Summit series switches across the Windermere and Bongard campuses with a link at Tauranga City Council where the 10 gigabit fibre between campuses terminates. “We were using Hewlett Packard [switches] at the time, and while they were good, we weren’t quite comfortable with some aspects of their deployment or cost,” Das said in a statement. Bay of Plenty Polytechnic has 3200 full-time and 6800 part-time students. According to Das, 500 students are connected to the wireless network at any one time, with many more on the 1500 end-points scattered across the facility. He said that the current network capacity will serve the Polytechnic for the next six years with 10Gb standard across the backbone and 1Gb to the desktop. In addition, the network improvement has supported the rollout of new IT projects. Das said that its student management system will be replaced in 2013 with the Tribal ebs4 system, which records and manages information throughout the academic life of a student. Tribal offers curriculum planning and task automation. The network upgrade also allowed the Polytechnic to upload more digital content to Moodle, an open source learning management system that allows students to create websites and view multimedia resources. 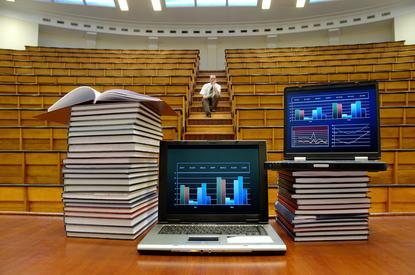 Tutors use Moodle to record lectures or implement virtual learning environments for students.